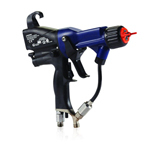 Electrostatic spray guns are great for both low and high-pressure applications. The gun applies an electrostatic charge to the paint. 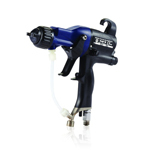 This gives the coating a negative charge so the paint is pulled towards its surface. 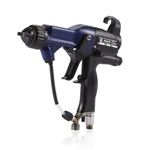 Up to 25% of coating can be saved through the use of an electrostatic gun compared to standard spray guns. At Spray Direct, we offer several models of Graco electrostatic spray guns. 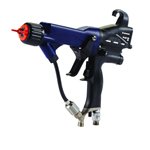 Each model number states its maximum voltage output, so the Xp85 has a maximum voltage output of 85kV. 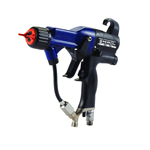 These guns have a Standard and Smart version, where the Smart version offers the user Smart Controls which help you analyse performance, adapt voltage needs and give you diagnostic information. 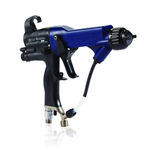 We also provide Graco Triton and Graco Merkur electrostatic spray gun and pump packages. 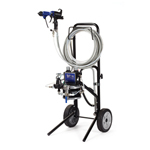 The Triton pump is a more effective alternative to traditional pressure pots and standard diaphragm pumps. 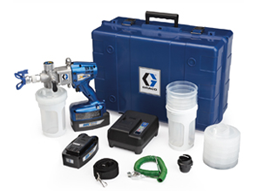 It provides 50% less pressure pulsation and 30% more suction power than a standard diaphragm pump. 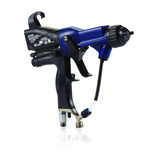 While the Merkur pump is the highest air motor on the market. 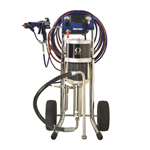 Its dual atomisation results in a fine spray pattern, giving a high-quality finish that standard airless systems are unable to produce, whilst still maintaining a fast coverage speed.